Induction motors are the most important workhorses in industry. They are mostly used as constant-speed drives when fed from a voltage source of fixed frequency. Advent of advanced power electronic converters and powerful digital signal processors, however, has made possible the development of high performance, adjustable speed AC motor drives. This book aims to explore new areas of induction motor control based on artificial intelligence (AI) techniques in order to make the controller less sensitive to parameter changes. Selected AI techniques are applied for different induction motor control strategies. 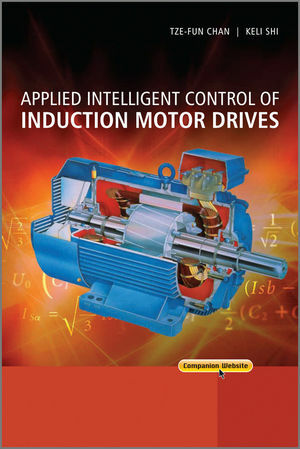 The book presents a practical computer simulation model of the induction motor that could be used for studying various induction motor drive operations. The control strategies explored include expert-system-based acceleration control, hybrid-fuzzy/PI two-stage control, neural-network-based direct self control, and genetic algorithm based extended Kalman filter for rotor speed estimation. There are also chapters on neural-network-based parameter estimation, genetic-algorithm-based optimized random PWM strategy, and experimental investigations. A chapter is provided as a primer for readers to get started with simulation studies on various AI techniques. This book will be invaluable to graduate students and research engineers who specialize in electric motor drives, electric vehicles, and electric ship propulsion. Graduate students in intelligent control, applied electric motion, and energy, as well as engineers in industrial electronics, automation, and electrical transportation, will also find this book helpful. Tze-Fun Chan is an associate professor of electrical engineering at the Hong Kong Polytechnic University, where he has been working for over 30 years since 1978. Chan’s research interests are self-excited induction generators, brushless AC generators, permanent-magnet machines, finite element analysis of electric machines, and electric motor drives control. In June 2006, Chan was awarded a Prize Paper by IEEE Power Engineering Society Power Generation and Energy Development Committee. In 2007, Chan co-authored a book published by Wiley. He received the B.Sc. and M.Phil degrees in electrical engineering from the University of Hong Kong in 1974 and 1980 respectively. He received his PhD degree in electrical engineering from City University London in 2005. Keli Shi is a Research Engineer of Netpower Technologies Inc.. His research interests are DSP applications and intelligent control of induction and permanent magnet machines. He received his BS degree in electronics and electrical engineering from Chengdu University of Science and Technology and MS degree in electrical engineering from Harbin Institute of Technology in 1983 and 1989 respectively. He received his PhD in electrical engineering from The Hong Kong Polytechnic University in 2001.